Chef Gerald Prete of University of Colorado says this play on a caprese salad is the university’s most popular salad. “It is easy to make, and is very refreshing,” Prete says. “This salad is very bright to the eye and draws customers in immediately.” The salad features a raspberry balsamic vinegar dressing and fresh mint. Field greens and baby spinach play host to grapefruit, oranges and strawberries. Prete says any local, ripe fruit can be substituted in place of the strawberries—he suggests watermelon when it’s in season. For vinegar: Place ingredients in non-reactive container with lid. Cover and place in refrigerator for minimum of 10 days. After 10 days, strain and reserve dressing for salad. For salad: Toss field greens and spinach together. Gently toss together citrus sections. For each platter, layering from the bottom up, place greens down, sprinkle evenly 2 cups of the citrus sections, then sprinkle 1 cup of strawberries. 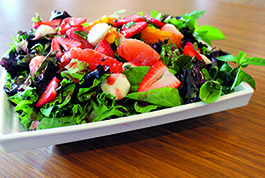 For last layer, evenly sprinkle mozzarella over fruit and greens, then drizzle 1/4 cup of sweetened vinegar over salad. Garnish with freshly torn mint.